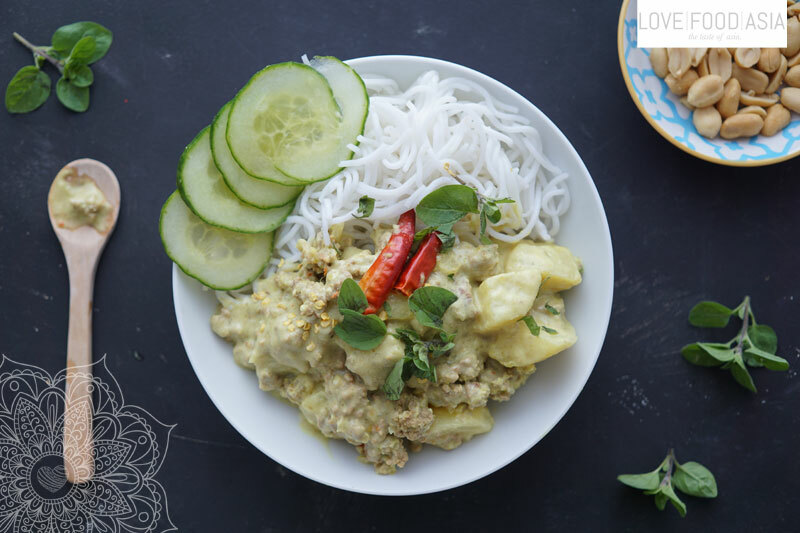 This yellow curry is inspired by a fish curry from South Thailand called Khanom Jeen Nam Ya. Most of the Thai currys will be served with fish but this creamy curry comes with Khanom Chin (Vermicelli rice noodles). The noodles and the Curry are a perfect combination when you serve it with fresh cucumber and lemon basil leaves. We kept this recipe very simple and it is perfectly made for a during the week dish. Stir fry yellow curry paste in peanut oil for one minute. Add onions and chilis. Fry for another minute before you stir in minced pork. Stir fry until golden brown. Daglaze with coconut milk and vegetable stock and bring to a boil. Reduce heat and add star anise and lemongrass. Simmer on low heat for 15 minutes. Add potatoes and simmer for another 10 minutes. Stir in carrots and simmer for another 5 minutes. Place Vermicelli noodles in a heat proof bowl. Boil water and pour over the noodles until “al dente”. Season with fish sauce, pepper and salt. Serve with Khanom Chin, roasted peanuts, cucumber slices and fresh lemon basil leaves.